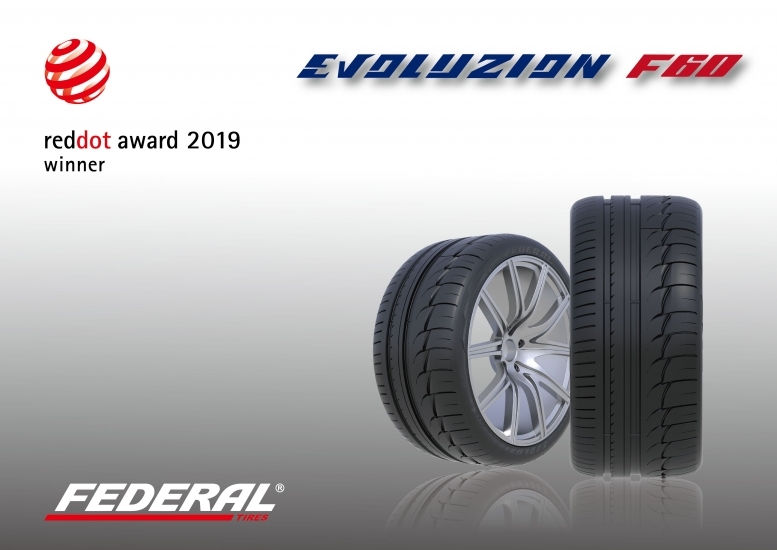 Federal Tires’ Evoluzion F60 has won the prestigious Red Dot Award 2019. With this year’s win, Federal Tires has now been awarded by Red Dot Product Design Award for three consecutive years, reinforcing Federal’s global leadership in tire design. The Evoluzion F60 is Federal’s flagship UHP tires for super cars. New silica-infused tread compounds provide outstanding rigidity and enhanced durability while triple circumferential grooves and inner tread grooves maximize wet traction at high speed. These features accentuate unprecedented responsiveness, expert handling, ultimate tread life, and comfort all together. "Winning Red Dot Award consecutively is truly monumental to our tire performance and quality. We are very proud that our Evoluzion F60 has received such global recognition from the Red Dot Award again and we will continue to enhance our product competitiveness through continuous R&D concentration," said Da-Wu Chen, Global Sales and Marketing Director of Federal Tires. The Red Dot Design Award is considered one of the world’s biggest design awards. Evaluations are made based on innovation, aesthetic characteristics, applicability, functionality, and efficiency. This year’s Red Dot Design Award included applicants from over 55 countries and 5,500 products.